I’ve thoroughly enjoyed reading Adaptive Markets: Financial Evolution at the Speed of Thought by Andrew Lo. I should say that, apart from being a distinguished MIT finance professor and the co-author of the classic A Non-Random Walk Down Wall Street, Andrew is an old friend. But this should not put off any readers. This new book will become another essential read for anybody interested in financial markets. The book aims to do what ultimately all of economics must do, and situate economic decisions and behaviour in the context of our biology and evolutionary history. Behavioural economics and finance have gone some way toward this in introducing the now-familiar heuristics such as loss aversion and framing effects, and herding is a familiar phenomenon in finance models. The issue with these has been how if at all they relate to rational choice models and the Efficient Markets Hypothesis. 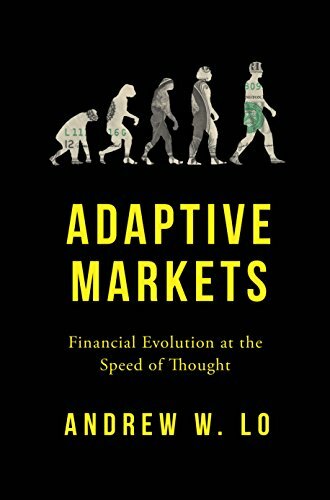 The Adaptive Markets Hypothesis is a synthesis, proposing that context makes the difference, and when conditions are sufficiently stable for long enough, financial markets are efficient. Otherwise, fear, greed, fairness, imagination – the characteristics evolution has given the human brain – kick in. The opening chapter starts with a powerful demonstration of the potential efficiency of markets: after the Space Shuttle Challenger tragically exploded on 28 January 1986, a five month inquiry pinned the blame on a part, the O-ring, manufactured by one of four contractors, Morton Thiokol. Yet on the day of the accident, the share price of Morton Thiokol plummeted – the markets knew the company was to blame almost immediately, without the expert verdict: “Somehow the stock market in 1986 was able to aggregate all the information about the Challenger accident within minutes, come up with the correct conclusion and apply it to the assets of the company.” The decline in its market capitalization – about $200m – was almost exactly equal to the damages, settlement and reduced future cash flow, a later study found. But often, of course, financial markets are all too obviously sometimes not efficient. The intellectual challenge is to figure out when they are in which mode. The book voyages through neuroscience, psychology, evolutionary biology and AI to try to answer this. The Adaptive Markets Hypothesis reverses the conventional framing: rather than thinking about a rational benchmark with a set of psychological quirks sometimes kicking in, we are a collection of quirks, but sometimes we can get beyond the heuristics to rational choice. The book is a thoroughly interesting and enjoyable read. It is not technical, the explanations are super-clear, and there is some excellent story telling. Andrew recounts how in 1986 he and his co-author Craig MacKinlay, presenting at the NBER the work that turned into A Non-Random Walk Down Wall Street, were savaged by discussants from the world of academic finance. Since then, the academic community’s faith in the Efficient Markets Hypothesis has wavered significantly, but it is still the benchmark – as the book says, it takes a theory to beat a theory. I find the Adaptive Markets Hypothesis a persuasive theory, but then I firmly believe economics must be consistent with what we learn about ourselves from the other human sciences. I guess the test will come in the shape of how widely market participants themselves embrace it. This entry was posted in Main Page and tagged evolutionary theory, financial markets, review by Diane Coyle. Bookmark the permalink. Where is the quantification of decision-making that is ratio of rational vs irrational? Is it 1:1, 2:1, 10:1, 1:5 ?? (50%, 67%, ~90%, ~20%)? I think in house buying, there was some 90-95% rational decision making by the buyers, with far less, maybe only 70%, on the part of mortgage loan suppliers. I haven’t read much about varying degrees of rationality, but believe it’s an important and understudied topic. The 1991 – 2000 (dot.com bubble) – 2005 increasing house prices was pretty “stable”, according to most trends. The non-efficiency was that the “stable” growth was not genuinely sustainable. Rationality, used on a model whose “key assumption” fails (house prices always rise! ), will certainly fail. Thus, better models that don’t fail are almost a pre-requisite for using rationality without failing. Unfortunately, this leads to Grey’s Law* : any economic law or model, which can reliably used by its followers to achieve higher returns, will induce behavior change such that the law or model will be invalidated.